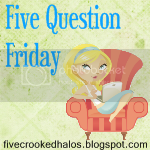 The fabulous Mama M over at My Little Life also does a regular Friday Blog Hop event called Five Question Friday. I'm not yet brilliant enough to have a special day/idea of my own, but I'm working on it. Until then (and even after, 'cause these gals are rockin' it!) I will be throwing their goodies out there with my own answers and lots of links! Rules: Copy and paste the following questions to your blog, answer them, grab the MckLinky Blog Hop code, and link up! No blog? That's okay! Just leave your answers in my comments! Then be sure to visit Mama M. and find out her answers and how to submit a question for 5QF! 1. What were you doing the last time you really had a good laugh? 2. Who was your first CELEBRITY crush? 3. What is one talent that you wish you had? 4. How often do you and your spouse go out w/o the kids? Is it frequent enough? 5. What colour(s) is your bedroom? 2. I had the biggest, wildest, gonna marry that boy and we'd talk to dolphins for the rest of our lives crush on Jonathan Brandis. Anyone else ever watch seaQuest DSV? Boy was yummy. 3. Like Mama M, I wish I could sing well. I love to sing, and I have the mechanics of it, but not the tone quality. I'm a rock star in the car, though! 4. My husband and I rarely go "out" just the two of us. We will do social events with friends every couple of months, but almost never sneak out sans kids without a really specific reason. We hang out after the kids are in bed most evenings, usually catching up on SportsCenter, or reading books or the paper or whatever and just chatting about the day, but we've had some pretty tight financial situations over the last several years, and just got out of the habit of going out. 5. Our room is a really plain shade of beige. White doors, white trim. We don't have matching bedroom furniture, either. Our bed was his bed, he has his old dresser, I have mine. I did buy us a nice bedspread when our local JC Penney's was closing, but that's about it. Oh, and plain old white sheer's on the windows. Bleh. There's my five answers! Now share yours! Either throw your answers in to the comments, or post 'em to YOUR blog and be sure to leave your link! Didn't Jonathan die or commit suicide? Morbid, I know, but I seriously feel like I remember that happening (or at least being a rumor at one time!). I almost posted his suicide as part of the post, and then I didn't. He hung himself in 2003. Such a waste. Sounds like we all need to get together, find a good babysitter (or 10) and all go out! I don't recognize this Jonathon guy, but that's sad about a suicide.